The purpose of the activity is to get students out of the traditional classroom setting and to spend several hours navigating their way between various localities on campus where different rock types are used for a variety of purposes. 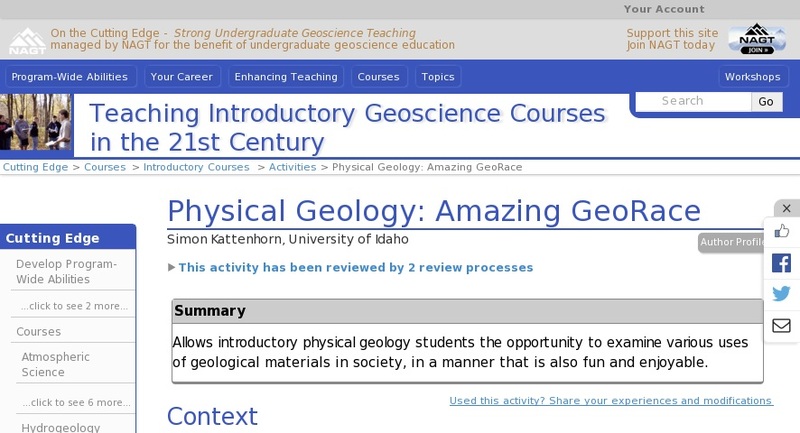 Students are encouraged to bring along their introductory geology laboratory manuals to remind them of the techniques used to correctly identify rock types. The activity is designed to promote enjoyment of the task (clues need to be "solved" to figure out the location of the next outcrop in the sequence) and to encourage students to follow the task through to completion. As a result, students invariably spend many hours engaged in the activity despite the fact that it is completely optional.